The newborn would probably live just a few days, the doctors said. The baby’s lungs were severely underdeveloped, starving its tiny body of oxygen. Somehow, doctors at Shands Hospital had to find a way to breathe life into the child’s blood. It was 1991, and the University of Florida physicians were about to take the first step on a journey that has saved hundreds of lives since then. That baby was attached to a machine that turned a likely death sentence into a fighting chance at life. The device is called extracorporeal membrane oxygenation, or ECMO. Like water to a dry and wilted flower, ECMO brings life back from the brink. The machine takes blood out of the body, oxygenates it, removes carbon dioxide, warms it and then pumps it back into the patient. It assists the lungs, the heart, or both, until they heal or until the patient undergoes a lifesaving procedure, such as a transplant. Today, UF Health has a robust ECMO program with a highly trained and dedicated team of surgeons, nurses and specialists treating a growing number of patients who are among the sickest of the sick. Some are patients with severe pneumonia who fall into acute respiratory arrest. Others are trauma victims whose hearts are too weak to pump blood through their body. There are asthma patients and those waiting for a donor heart or lung. ECMO provides them all with the precious gift of time. That first ECMO patient at UF in 1991 became the first life saved. At least 591 children and adults have since been placed on ECMO. — Saleem Islam, M.D., M.P.H. One of those patients is Maria Forbes. Maria, then a 13-year-old soccer player, returned home to Ocala from a weekend tournament early last year with a headache and feeling exhausted. Soon, her mother, Vanessa, noticed Maria’s fingers were turning purple. She rushed Maria to a nearby emergency room. Maria was then airlifted to UF Health Shands Children’s Hospital, where she was admitted to the pediatric ICU with severe acute respiratory distress syndrome and septic shock secondary to the flu and pneumonia. Her lungs were failing. Her doctors placed her on an ECMO machine. It was a tough road. Maria spent eight months in the hospital before being discharged to a rehabilitation facility. Through it all, her stamina and perseverance astonished everyone who met her. ECMO gave Maria’s lungs time to heal. Some people are placed on ECMO for a few days. Some for a couple of weeks. ECMO kept Maria’s blood rich in oxygen for 67 days. ECMO’s gift of precious time was paid for by years of painstaking research. The technology’s roots date to the bulky heart/lung bypass machines that helped surgeons pioneer open heart surgery. In 1953, the first open-heart surgery would be conducted by John Gibbon Jr., M.D., who developed a machine that interrupted the circulation of the patient’s blood and bypassed the heart and lungs. Gibbon’s device oxygenated the blood by running it down a series of wire-mesh screens in a chamber where oxygen flowed. But patients could only be placed on the machine for a few hours before complications arose, primarily because of damage to the blood’s constituent parts caused by blunt exposure to the oxygenator’s parts and the flow of oxygen itself. Advances in materials and methods by the early 1970s opened the way to extend those hours to days, weeks and even months. Modern ECMO machines are a far cry from their ancestors. The wire meshes are gone, replaced by membrane oxygenators the size of an adult human’s hand. Until recent years, ECMO machines pumped blood through the tubing system using roller pins in a cylinder that pressed down on the tubing, forcing blood through the system in a process that mimics the human heart. But newer technology uses centrifugal pumps, allowing the machines to be downsized. The weight of a newer model used widely at UF Health: 22 pounds. of the lungs and other organs, the teen’s doctors soon realized he needed a double-lung transplant. Matias was transferred to UF Health Shands Children’s Hospital in Gainesville from a hospital near his home in Port St. Lucie, Florida. Soon, he was in respiratory failure. Matias’ lungs could not provide his body with enough oxygen. It was clear to the medical team that ECMO machine was the last option to keep Matias alive until donor organs became available. But the doctors estimated that ECMO would not be able to support him for more than 48 hours. transplant surgery if he were to be place on the machine. Walking unaided for 10 steps would do it. “They don’t want to give lungs to a patient who isn’t going to fight for those lungs,” said Matias’ mother, Andrea Cozzi. Already weak from complications that included pneumonia, Matias had one chance to prove himself to the medical team. Step by agonizing step, Matias completed the test. After a 12-hour transplant surgery in late September, he began a long recovery. He was discharged from the hospital in November. Any new technology attracts skepticism. And in 1990, Max Langham, M.D., felt it. M.D., to help persuade hospital leaders to launch an ECMO program. Then came that first infant suffering from a diaphragmatic hernia. The child was in critical condition, intubated. Ronald “Ronny” Pruitt, the head football coach at Union County High School in Lake Butler, was overcome with fatigue and a persistent cough during a 2016 spring break trip to the Bahamas with his wife, Robin. At a hospital, doctors discovered that Pruitt’s oxygen-saturation level was dangerously low. He was put on a ventilator and eventually an ECMO machine. Pruitt was flown from the Bahamas to Gainesville and UF Health Shands Hospital with symptoms of swine flu. His organs were deprived of oxygen, and doctors feared he might have suffered brain damage. One day, Pruitt awoke from a 33-day induced coma, his brain intact. He recovered quickly. “There were a lot of prayers, and I had some great nurses and doctors,” he said. Pruitt didn’t wake up on just any day. It was the opening of Union County High School spring football training. ECMO brings with it potentially severe complications. Clots are one danger, and that has required the use of anticoagulant medications such as heparin. This, in turn, can lead to bleeding. ECMO systems now use heparincoated tubing, which provides a defense against clotting. But the risk remains. 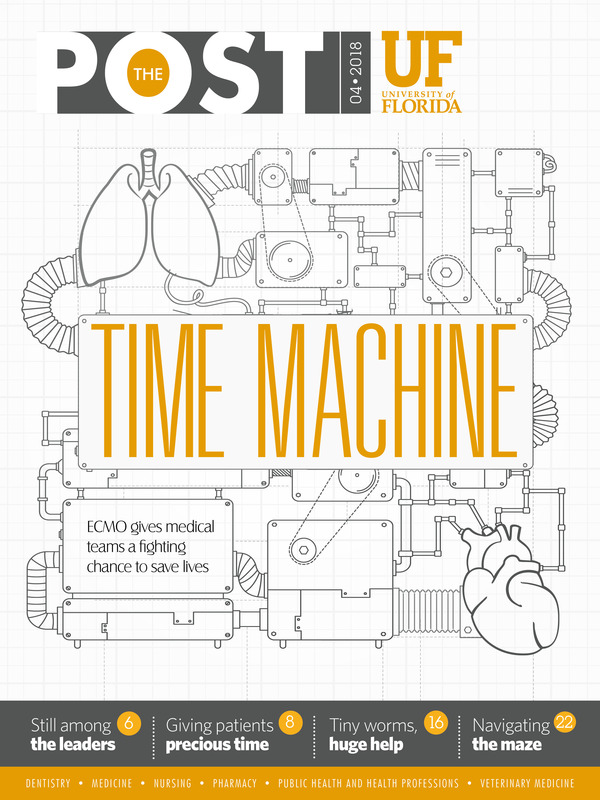 Since 1991, 76 percent of UF Health ECMO patients have survived to be taken off the machine, said Bantle. That track record has led to an expansion of ECMO’s use in situations once thought ill-suited for it. “It increasingly is being implemented earlier in the course of disease to minimize multiorgan failure,” said Andres Pelaez, M.D., the medical director of the UF Health lung transplant program and an associate professor in the UF College of Medicine. Pelaez is also co-director of the adult ECMO program with Hassan Alnuaimat, M.D., an associate professor of medicine and director of the pulmonary hypertension program in the UF College of Medicine. ECMO was long used overwhelmingly in pediatric cases, most often in newborns whose resilient lungs were especially responsive to the treatment. Early studies indicated adults didn’t fare as well, so treating adults fell out of favor. That changed about a decade ago with the advent of the swine flu. With improved technology and methods, adults placed on ECMO for flu-induced respiratory distress fared well. Adult treatment is today predominant at UF Health and around the nation. It’s important to remember, said Islam, the need for ECMO is relatively rare. UF Health expects to treat about 60 ECMO patients in the 12 months ending June 30, a majority of them adults, he said. It was a terrible car accident last spring. Every system in Brandon Taylor’s body was compromised. He had a broken back and neck, severe injuries to his head and chest. His lungs weren’t functioning. They needed time to heal. Taylor was taken to UF Health Jacksonville, where he became the first adult patient at the hospital to be placed on ECMO. Taylor doesn’t remember the time in the hospital. But he fought back. Soon enough, Taylor was sent home. Later in 2017, Taylor and his wife returned to the hospital to thank his caregivers. ECMO takes great commitment from a patient’s health care team. ECMO specialists must check the machinery hourly, pointing flashlights at the web of tubing looking for clots and other problems. For some of the most critically ill patients, stopping the machine for two minutes to change out a line is too long. It is stressful work. A life is on the line. Always. Bantle said the machinery can be intimidating to trainees. ECMO specialists, however, thrive at the challenge. They describe the work in words that make clear this is less a job than a calling. initiate something that will help save that patient’s life until they get over an illness or, if they need a heart or lung transplant, to get them over that hump. “It doesn’t always work out like you want it to,’’ he added. “And it can be disheartening at times. It’s very intense. A severe asthma attack in December left 2-year-old Garon Flanagan struggling to get enough oxygen into his lungs and body. The boy’s family brought him to The Studer Family Children’s Hospital at Sacred Heart in Pensacola. Standard treatments were failing, including the use of a ventilator and medications to relax and open Garon’s airway. His physicians consulted with UF Health Shands Children’s Hospital, the hospital’s referral center. Garon was connected to an ECMO machine in Pensacola, then transported to Gainesville. “We were running out of options with a child’s life in danger,” said Bryan Weidner, M.D., a pediatric surgeon at The Studer Family Children’s Hospital. Soon, little Garon was recovering, his body flush with oxygen. One more of the 591.